More Pictures From The Funky Junk Sisters Show! Friday night was a blur.... the weather was blustery and the warehouse was filled to the brim with junk and lots and lots and lots of shoppers! 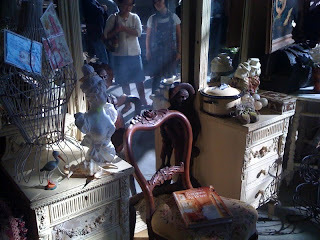 Before the doors opened we had a photographer come in and take photographs for a magazine, they are doing a story on flea markets. We'll give you more info on that later. 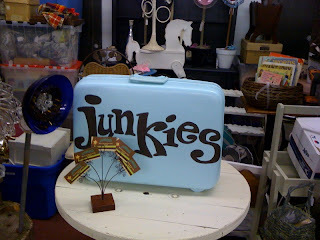 All of us junkies need a turquoise suitcase, don't we? This one was courtesy of the sisterhood of traveling junk. 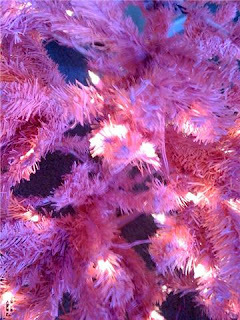 Pink, pink, and more pink from JohnBobCoolJunk! Today's Country Store never disappoints! 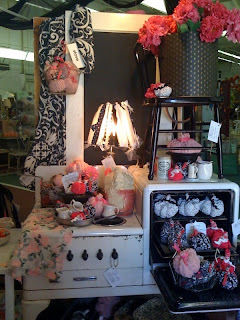 More pink from Tippy Stockton! 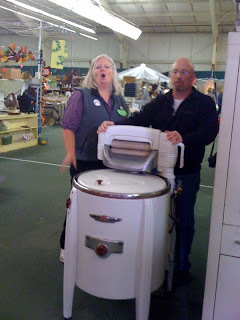 Pat & Billie were from Ellensburg, their specialty was vintage tablecloths. These gals were a riot, Prudence & Julie, they really kept things lively in their corner of the show! A sweet southern belle wouldn't be caught dead without her sunshade and Jill Radley had her decked out wonderfully, in pink of course! Here is an excited shopper that just won a door prize. 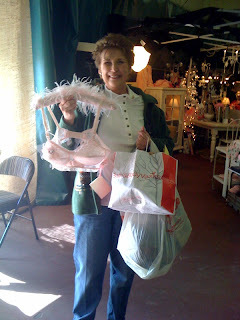 We made her wait for us to get a snapshot of the pink 50s vintage bra she won! Wonder what she will do with it? Maybe Madonna will want it for her next video! So glad someone brought the hubby along to carry things out to the car. Do you think he will do the laundry with this thing too? 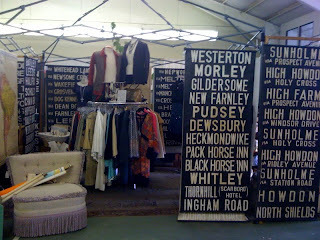 Vintage clothes and trolley signs from Europe. 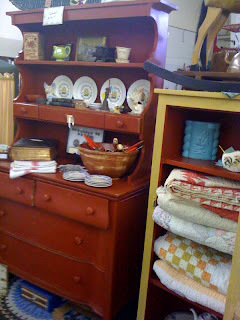 We absolutely loved this booth (Home Economics), it offered such unusual finds. 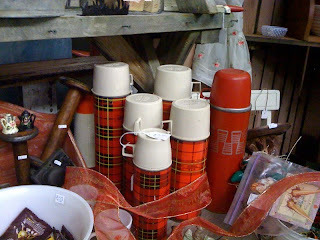 Liz Perry had a collection of old thermos jugs. Can you find the coffee drink in this picture!?! A sweet vintage stove filled with fabric pumpkins from Retreat. Make sure you keep checking the links in the post below, it seems everyone is talking about The Funky Junk Sisters Show. It Was All So Wonderful! Our show was an overwhelming success! We will share pics and write more about it later. 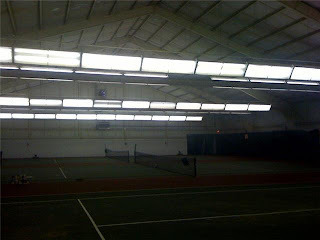 First we thought we would share some of the blog posts that others have written. Below are links to those.... We just had to show you the newest and cutest little funky junk sisters. These little darlins are Liz Perry's daughters. 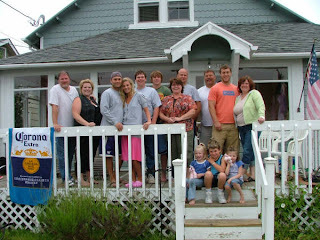 It seems they have the junk gene in their blood, mama's cousin is Teri Edwards, one of the original Farm Chicks! Aren't they adorable? 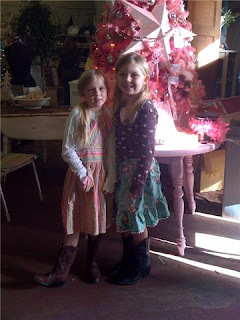 They posed in front of our Pink Christmas Tree that Mary Anderson of Whidby Island won! We will update this list daily, so check back often. Oh, and if we have missed one, please leave a comment to let us know and we will ad it! The Junk Sisters In Action! 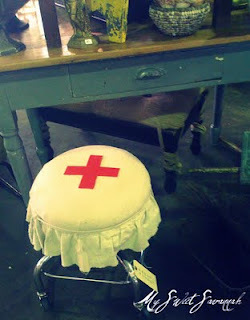 We are busily tending to things for our fabulous vintage flea market coming up this weekend. 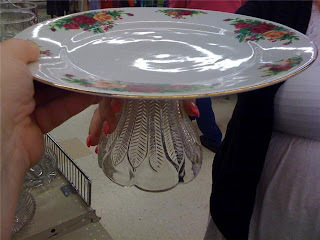 We needed some cake plates for serving our desserts at Friday nights fundraising event so..... we went junkin! 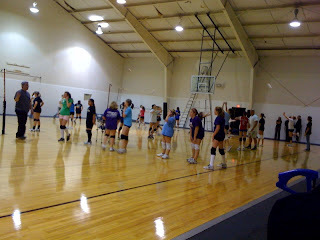 I took a couple of shots to let you see The Funky Junk Sisters in action. Luckily I am the camera gal so I always avoid shots of me, but here is a look at sisters #1 & 3 doin their thing. Here's our idea. You will get a chance to see it all at our delicious dessert buffet Friday night. 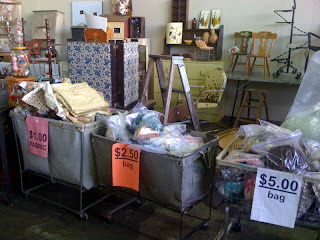 One more picture.... just wait til you see the transformation of this huge warehouse into a wonderland of vintage treasures for all junk queens (kings too). It's The Junk Queens Birthday! 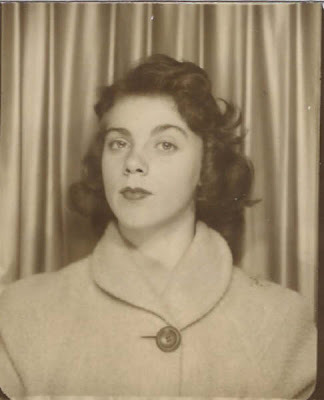 It's Mom's birthday! Come help us celebrate at The FUnkY JuNK SiSTerS ShOw, Friday and Saturday. 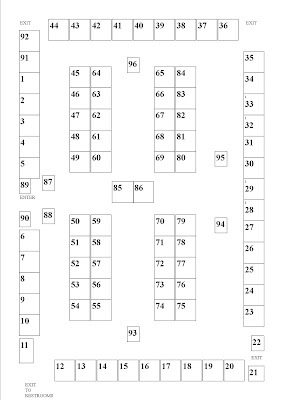 You know she will be there shoppin all the booths, ninety plus booths! You had better come early before she gets all of the good deals. SERIOUSLY! 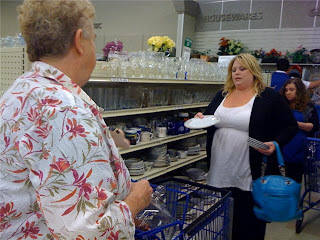 Remember she loves to hear all about all your great finds, so make sure you stop by to say HI! The Funky Junk Sisters Show Is This Weekend!!! We have hand selected "the best of the best" junk just for you. 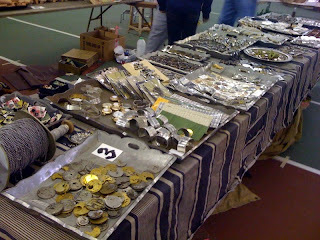 to take home all of your treasures! 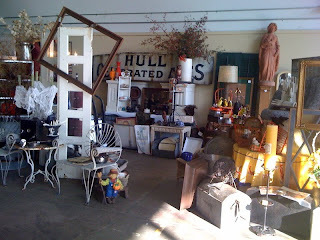 JOIN US ON THE HUNT FOR JUNK THIS WEEKEND! Life is Crazy Busy Around Here, but we Love it! Besides getting ready for this weekends Funky Junk Sisters Show, the Funky Junk family has alot going on.... One Funky Junk Husband is opening up a new facility. The Funky Junk Daughters have a big spectacular birthday party today. Last night a Funky Junk Nephew had a big football game...the Mt. Spokane Wildcats won 56-0! 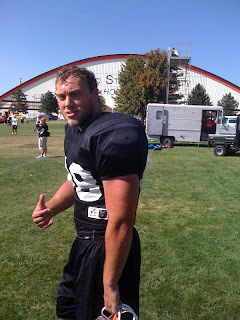 One more thing... a little eleven hour drive to Idaho to watch another Funky Junk Son play a game against Northern Colorado! We gotta tell ya, we can't wait for friday night's Girls Night Out, to gather with friends, talk girl talk and let our hair down! Whooo Hooo! 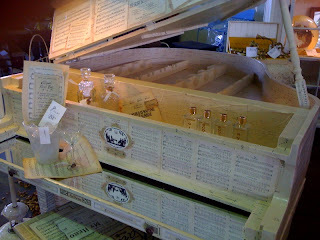 More wonderful photos from the Sandpoint Flea.... 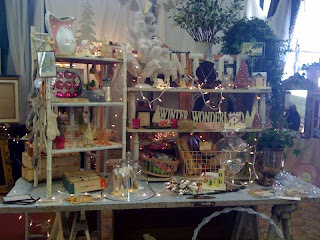 Here is the amazing Debi Ward Kennedy of Retreat Design. 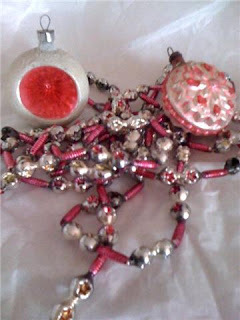 She is working her magic on our Pink Raffle Tree Project for our Funky Junk Sisters Show. We will have raffle tickets available at the show, it is just one week away! 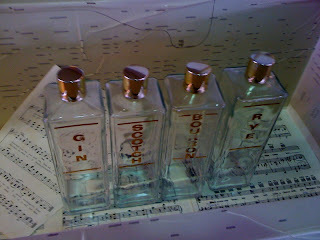 Gorgeous vintage decanters from Retreat. 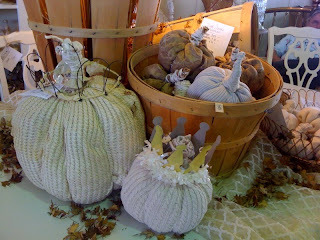 Here is a twist to the usual fall decor. Linda of Luluz was there too, we can't wait to see what she has saved up for the show. Once again some great stuff from Dawn of Great Findz. Her pillows are so fun. We are sure she will have plenty of these available at our show! 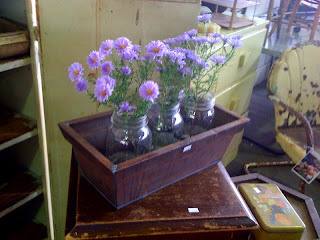 This past weekend I was lucky enough to wander off to the Sandpoint Antique Market. 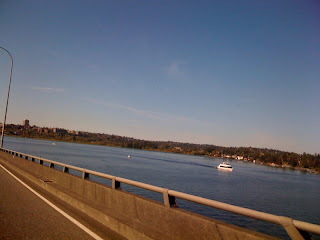 It was such a beautiful day, here is a picture of the scenery from the 520 bridge....shhhhh, don't tell anyone that I was driving across the bridge when I took this shot (the beauty of I phones). The Seattle area truly is a beautiful place to live! 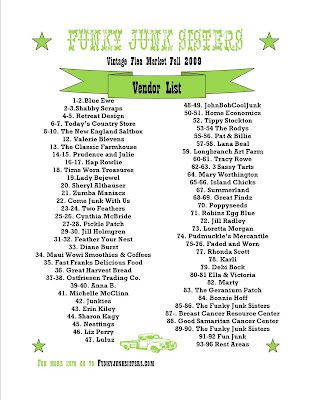 I arrived at the flea market to find several of the vendors that will be at the Funky Junk Sisters Show in a couple of weeks, including Jill Holmgren. 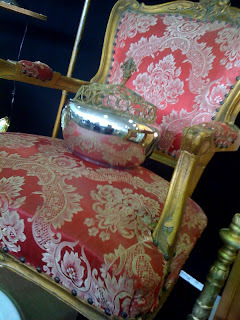 She had a set of these fabulous chairs. So Paris don't you agree? Can you say oui oui? 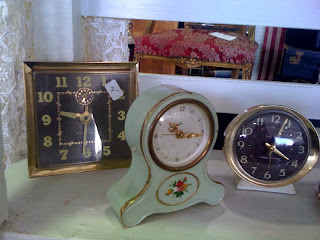 I wonder if these clocks are set for Paris time? 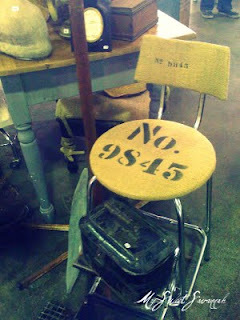 I visited with JohnBobCoolJunk too. 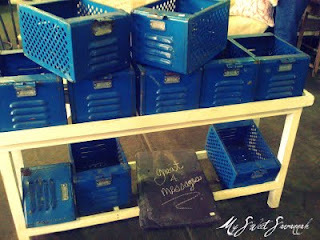 I was drawn to these bins full of vintage fabrics. There is something fun about having to literally dig through piles of stuff. They have tons of vintage barkcloth. John & Bob told me they are saving some really special stuff for our show....can't wait to see it! 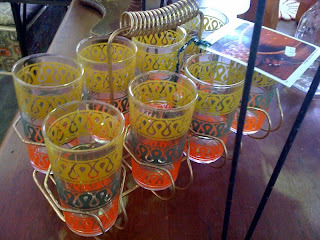 Retro glasses in a serving tray no less! JohnBob did you pick these up on your trip back East? 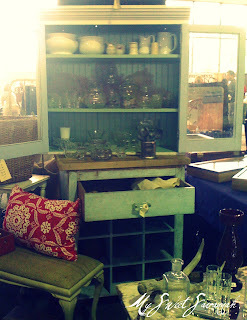 The sweet Debi Burton of Ormolulu always has lots of eye candy. 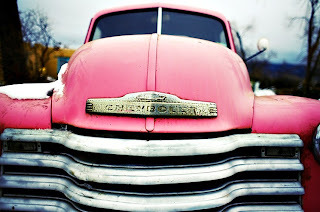 We imagine ourselves in a vintage truck in the perfect color piling flea market finds into the back. 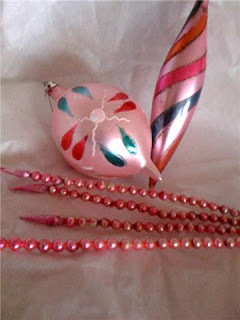 Just had to include this darling pink one. 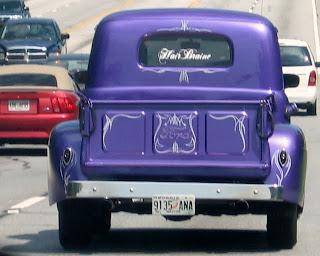 Its calling us by name.... fill me with Funky Junk.....Sistas! 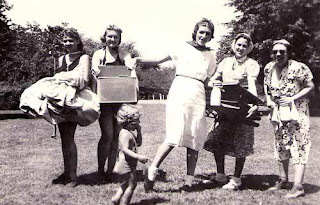 Ladies, grab your girl friends, pile in the old station wagon and come on over to our vintage flea market! 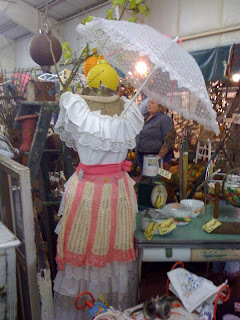 The Funky Junk Sisters Show has become home to some of the most exciting home furnishings, antiques and collectibles that can be found anywhere. The genuine, down-home human relationship between vendors and shoppers is the reason people keep coming back. This is a place where you can slow down, visit, ask questions, talk to collectors & antique dealers, and meet the artists and craftsmen who create one-of-a kind items. It is just two weeks away, and we are hearing about wonderful treasures our vendors have collected just for you. 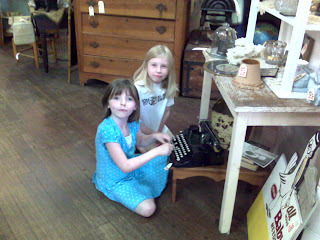 Get their early, (at least before Funky Junk Sister #1 aka MOM shows up) the good stuff goes fast! 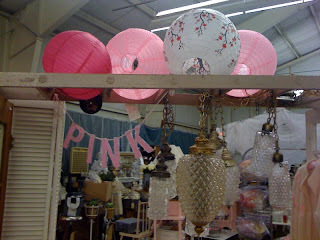 The market opens up Friday evening 6pm October 23rd with our big fundraiser event to benefit breast cancer awareness! If you can't make it then, come on Saturday and spend the whole day shopping (90+vendors) and drooling over all the cool vintage things. We were browsing around one of our favorite blogs a few weeks ago, My Sweet Savannah, and saw a post that featured one of Melaine's friends, Dawn. 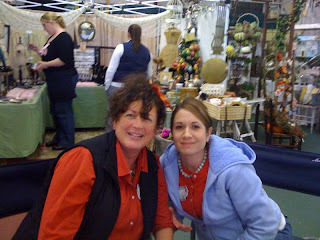 Once we saw these pictures, we remembered Dawn's booth from the Farm Chicks Show. Her booth was so busy, you could hardly move in it! 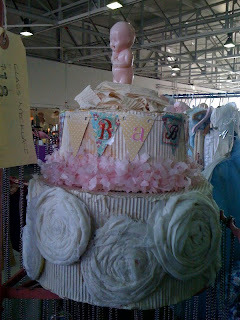 We are pleased to announce that Dawn will be a vendor at our Fall Show and shes bringing some great finds! 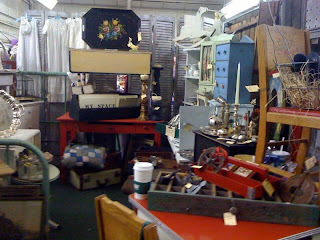 She scours Seattle estates and fleamarkets looking for fun & quirky items for the home. We especially love her pillows on her etsy site. 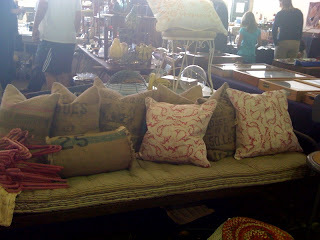 And her burlap designs are to die for! 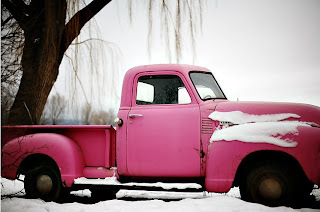 She is PINK!!! Isn't she lovely? We can't wait to see her all dressed up for the party on October 23rd! Our special designer, Debi Ward Kennedy has big plans for her! 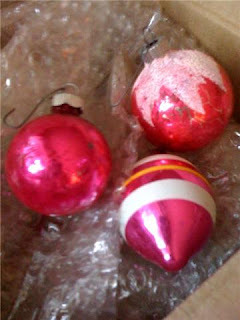 Our vendors are donating pink ornaments and they are beginning to arrive too! We are receiving so many packages right now that we feel like we are getting married again! 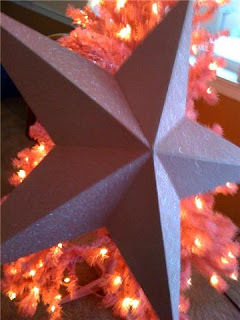 Below is a glittery pink star from Todays Country Store. 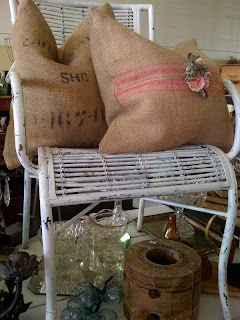 and these from Pat & Billie of Outback Antiques and Favorite Finds in Ellensburg, WA. 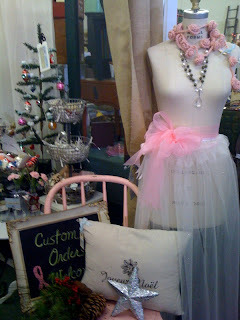 More vintage from Tracy Rowe also of Ellensburg. 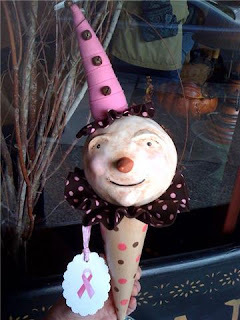 This one is a darling handmade clown from The New England Saltbox in Sumner, WA. 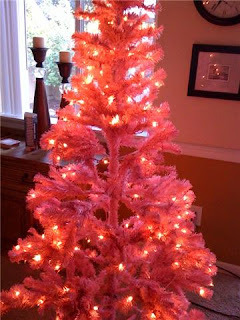 Hey all you girlie girls out there, you can have this tree all dolled up in your living room. All you have to do is buy a raffle ticket at our show on October 23 or 24. The proceeds from this raffle will benefit The Breast Cancer Resource Center in Tacoma. Jump on the bandwagon, help us help breast cancer survivors and find a cure! Meet some of our new friends! Get your tickets now for the Junk Bus! South Hill Mall Wants Our Junk!